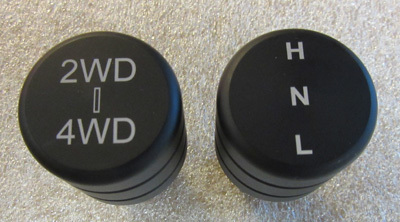 THESE KNOBS FIT THE LAND CRUISER TWIN STICK SHIFTER KIT. KNOBS ARE ENGRAVED ON THE TOP WITH 2WD – 4WD / H -L FOR THE TWO LEVERS. MADE OF ALUMINUM WITH A BLACK FINISH.